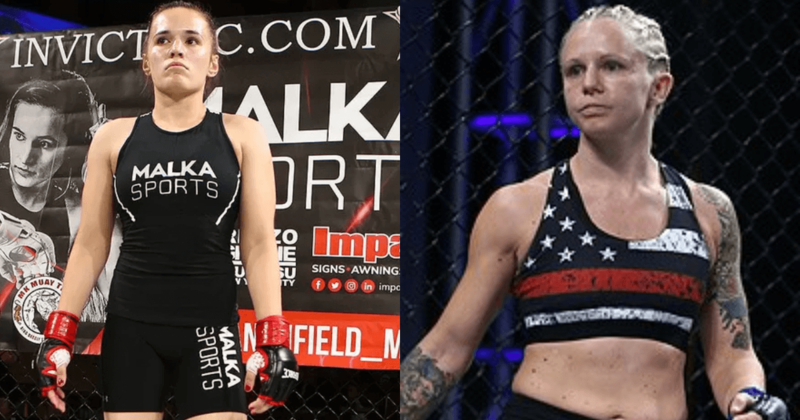 Invicta Fighting Championships has been the platform that many top female prospects have used as a launchpad to turn their UFC aspirations into reality. In today’s episode of Across The Pond, you will meet two fierce tigers whose fully loaded MMA arsenals have them hot on the trail of Invicta Fighting Championships ultimate prize. A professional since September 2016 and representing St Charles MMA, Kelly D’Angelo holds a 3-2 record in five career bouts as a professional comprised of one submission, one knockout and one decision. D’Angelo has fought for Invicta Fighting Championships, Hoosier Fight Club and Resurrection Fighting Alliance. In her MMA debut at RFA 44, she submitted The Ultimate Fighter season 26 alumni Emily Whitmire via guillotine choke in the second round. Then at Hoosier Fight Club 32 D’Angelo defeated Samantha Diaz via TKO in the third round. In her second appearance with Invicta Fighting Championships at Invicta FC 30, she defeated Lindsey VanZant via unanimous decision to secure her first victory under the Invicta Fighting Championships banner. At 3-2 and having a wide expanse of tools at her beck and call this Missouri tigeress is just beginning to scratch the surface of her potential! A professional since March 2018 and representing Silver Fox BJJ and Renzo Gracie NYC, Erin Blanchfield holds a perfect 3-0 record comprised of two decisions and one knockout. Blanchfield has fought for Invicta Fighting Championships and Cage Fury Fighting Championships. She is currently 2-0 under the Invicta Fighting Championships banner. In her MMA debut at Cage Fury Championships 70, she defeated Whittany Pyles via TKO. For her debut appearance with Invicta Fighting Championships at Invicta FC 30 Blanchfield defeated Brittney Cloudy via split decision. In her second outing with Invicta Fighting Championships at Invicta FC 32, she defeated Kay Hansen via majority decision to earn back to back victories with Invicta Fighting Championships and also extended her unbeaten streak to three to begin her professional career. Standing at an impressive 3-0, this empire tigeress is just beginning to flex her claws!